Home > Products > Laughing Buddha Statue Traveling Hotei Budai Lucky hand carved Wood Bali Art 24"
Laughing Buddha Statue Traveling Hotei Budai Lucky hand carved Wood Bali Art 24"
This statue is a HUGE Traveling Hotei also known as Laughing or Happy Buddha of Good Fortune, standing upon his traveling bag with a small small monk on his shoulder while holding his walking stick. 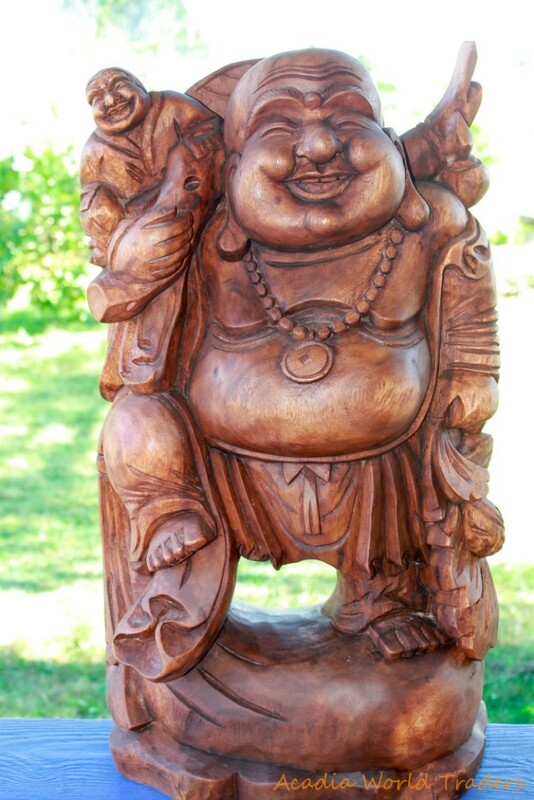 He has a round fat belly that is said to symbolize good luck and abundance. He was hand carved by talented carvers in Bali from a huge chunk of dense high quality suar wood which is a sustainable resource grown and harvested in Bali and Java. You will be receiving the exact carving shown here, this is a one of a kind carving hand picked by us in Bali. This wonderful work of the Happy Buddha will you good fortune! Small size is perfect for your personal altar or even your office. Although primarily a folkloric figure, he has been incorporated into a number of Buddhist and Taoist folklore traditions. the Budai is admired for his happiness, plenitude, and wisdom of contentment. One belief popular in folklore maintain that rubbing his belly brings wealth, good luck, and prosperity. In Japan, Hotei persists in folklore as one of the Seven Lucky Gods of Taoism. Budai is said to travel giving candy to poor children, only asking a penny from Zen monks or lay practitioners he meets. One day a monk walks up to him and asks, "What is the meaning of Zen?" Budai drops his bag. "How does one realize Zen?" he continued. Budai then took up his bag and continued on his way.